For those who observe the Biblical feasts, the determination of when to start the first day of the month is important. 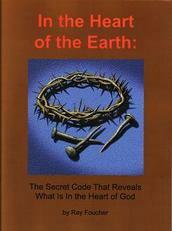 Biblically, this is tied to the lunar cycle but there are some different theories as to how the connection works. Most commonly, it is the sighting of the visible crescent just after sunset that is used. Some however, have proposed that the astronomical new moon (conjunction) should be used to signal the first day of the month. This study examines that question in light of the astronomical facts. Theory: It is impossible to always determine accurately, by observation, the day of the astronomical new moon. Let me illustrate. Consider the astronomical full moon; it is easier to visualize observation of the astronomical full moon which is 1/2 cycle away from the astronomical new moon. I have had people tell me that they can always tell by observation which night is the full moon. Just by visually comparing the fullest moons in the diagram below of the moon phases, I would say that would be fairly difficult. And in the diagram you can look at moon disks side by side. With an actual moon observation you would have to remember on successive nights how full it looked the other nights. Could you do that? Let's reason it out logically. The astronomical full moon is the point at which the moon is in exact opposition to the sun. That is when the sun, moon and earth are exactly lined up with the earth in the middle. It can happen any minute of the day. If it happens when it is say midnight where you live you will see the moon very well because the side of earth you are on will be facing away from the sun and towards the moon (diagram 1) and the moon will be at its highest point in the sky. Now, let's say that the moment of opposition happens at noon your time. You will not see the full moon at that point because you are on the side of the earth away from the moon (diagram 2). If you were observing the moon at midnight each night and went out the night before and the night after the point of astronomical full moon (diagram 3) you would, of course, miss the moment when the moon is fullest. It would be fullest at noon your time but then you would be facing the sun with the moon on the other side of the earth. 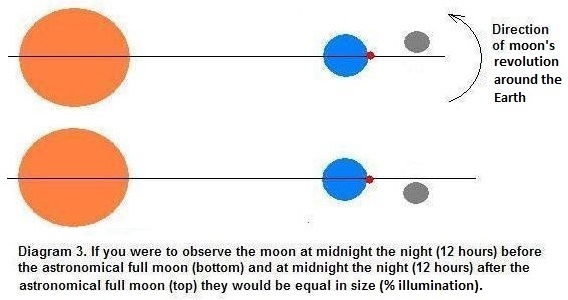 However, on those two midnight observations, the moon would appear equal in terms of % illumination (% of the moon's disk that is reflecting the sun's light) because it would be equal distances from the point of opposition. Here is the question for those who say they can judge by eye which is the night of full moon: Can you judge between 98% and 98.5% illumination or even less of a difference? There will be months when it is impossible to judge by eye which is the night of fullest moon. The same is true for the point of the astronomical new moon except that it is even more difficult to determine. 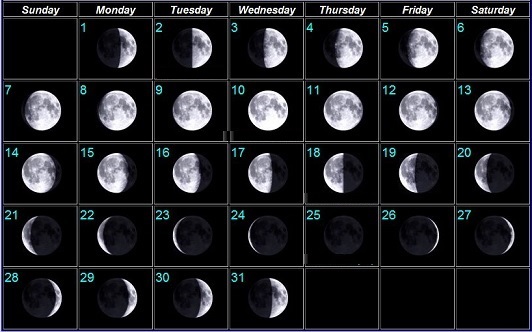 A person has to judge which day is closest to the day of conjunction based on something they can't even see because the moon is between the earth and the sun. Using the astronomical new moon requires prior determination of the point of conjunction. It also requires a high degree of accuracy. What if the point of conjunction is very close to the moment of sunset? Which side of sunset it falls on would determine which day is the new moon day. And you can't even see the moon then. Can a person determine, by observation, when the sun, earth and moon are exactly lined up when they can't even see the moon? No, it is impossible. Somehow a sighting of the new moon as a visible crescent seems much simpler. It can be done by direct observation - either you see it or you don't. (The only confounding factor then is cloud cover and that wasn't in the mix originally - before the flood.) If the crescent is seen just after sunset it is the beginning of the new month. Just one more point. If the moment of conjunction is used, it could happen in a month where conjunction occurs shortly before sunset (making that almost-finished day the first day of the new month) that the month is started almost a full day before the signal for its start occurs. I believe the theory holds up - it is impossible to always determine accurately, by observation, the day of the astronomical new moon.